The Miami Open Tennis tournament is more popularly known as the Miami Masters, which is a part of the ATP tour. Miami Open is a professional tennis tournament for both female and male tennis players. The competition consists of two separate categories, including singles and doubles, that is, a team of two tennis players. This year’s season of the Miami Open tennis tournament is the 35th edition of the competition scheduled to take place from March 18th to March 31st. 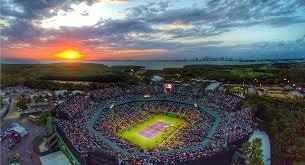 Throughout this period, tennis fans from all over the world can follow all Miami Masters live scores and statistics. The Miami Masters tournament is an official part of the famous ATP Tour where it is filed under the Masters 1000 category. The tournament is also a premier event in women’s tennis where it is considered a part of the Mandatory Category on WTA Tour. All tournament’s matches are played outdoors on a hard court. Interestingly, this year’s season will be the first time that the Miami Masters tournament is held at the Hard Rock Stadium located in Miami Gardens. The current Miami Masters champion in men’s ATP Tour is John Isner, whereas the doubles championship title is held by US players Bob Bryan and Mike Bryan. When it comes to women’s categories, the last season’s champion is Sloane Stephens. The doubles championship title is held by Ashliegh Barty and Coco Vandeweghe. The Miami Open tennis tournament is one of the most important tennis events of the year as the results of this tournament count towards the players’ overall scores in ATP and WTA Tours. If you are a fan of professional tennis players and competitions, you can follow the Miami Masters from march 18th right here on xscores.com. We provide immediately updated live scores and statistics of all WTA and ATP Tour matches and events.